Five Nines (999.99) which first opened at Keong Saik Road has now been relocated to Cuppage Plaza level 4. In fact, it has done a musical chair with Kyuu, swapping premises. Putting the restaurant's group reason for doing so aside, lets see whether Five Nines is able to maintain its gold standard with a new Chef at helm and new menu. For my visit, I had the 6 course dinner at $49. The first course is Marinated Botan Shrimp and Couscous Salad with tosazu vinegar and salmon roe. 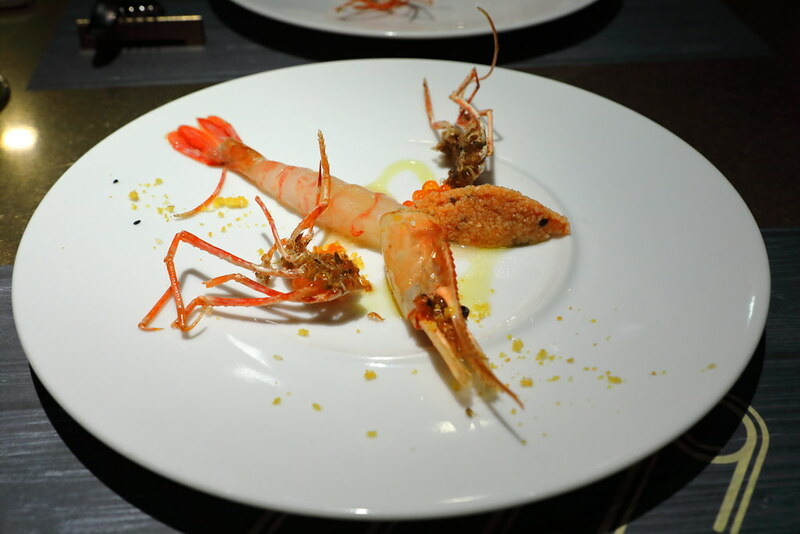 I can't deny the sweetness and freshness of the botan shrimp, as well as the idea of appreciating the different textures of the botan prawn. However the whole execution and presentation did not quite excite me. It felt rather bare, rough and unappealing. The second appetiser is Foie Gras Terrine and Bruschetta with instant smoked orange jam. 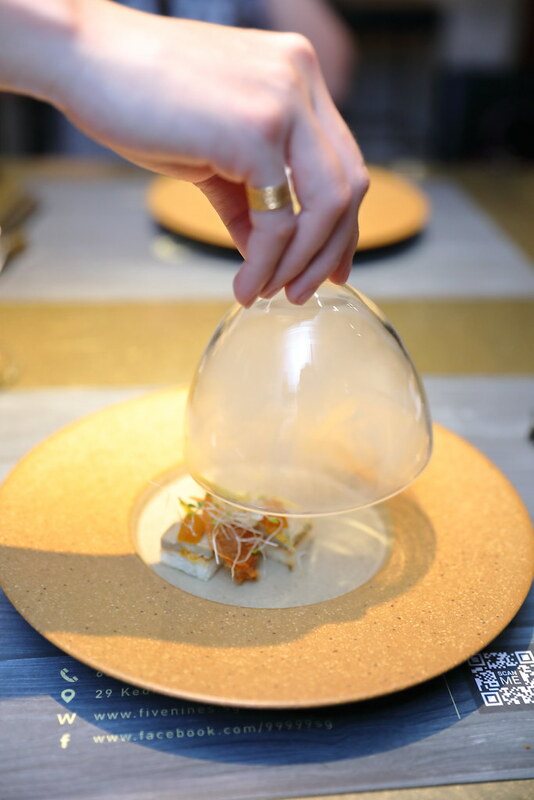 I really felt the smoking effect was rather gimmicky and it didn't really complement the dish. Rather I felt it was a bit too thick and unpleasant, distorting the appreciation of the main ingredients. 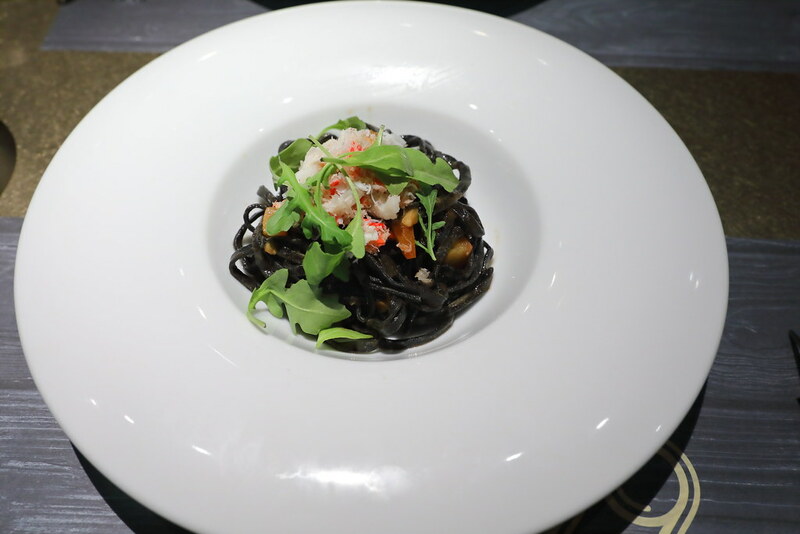 For the pasta dish, one has a choice between the Lobster Spaghetti with Creamy Tomato Sauce or Garlic Flavoured Squid Ink Tagliolini topped with Snow Crab. 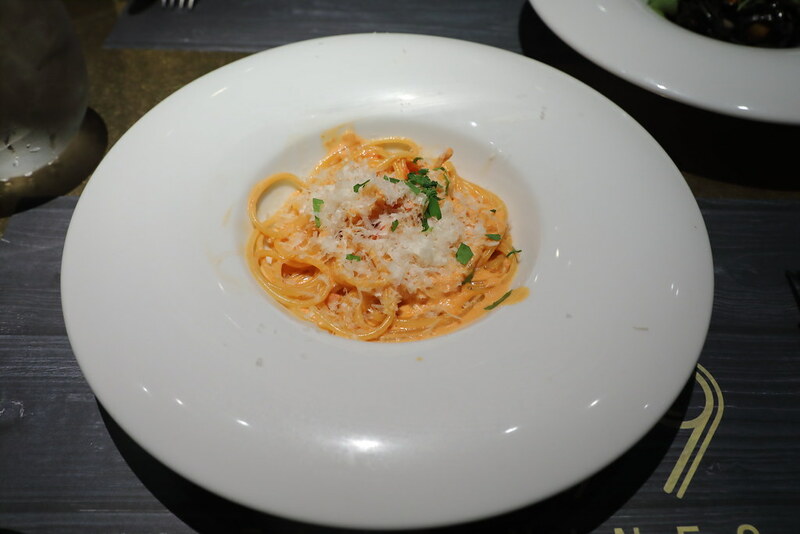 I like my pasta to be saucy hence I preferred the lobster spaghetti with creamy tomato sauce. For those that enjoys a firmer bite and less creamy, the squid ink tagliolini will be a good choice. 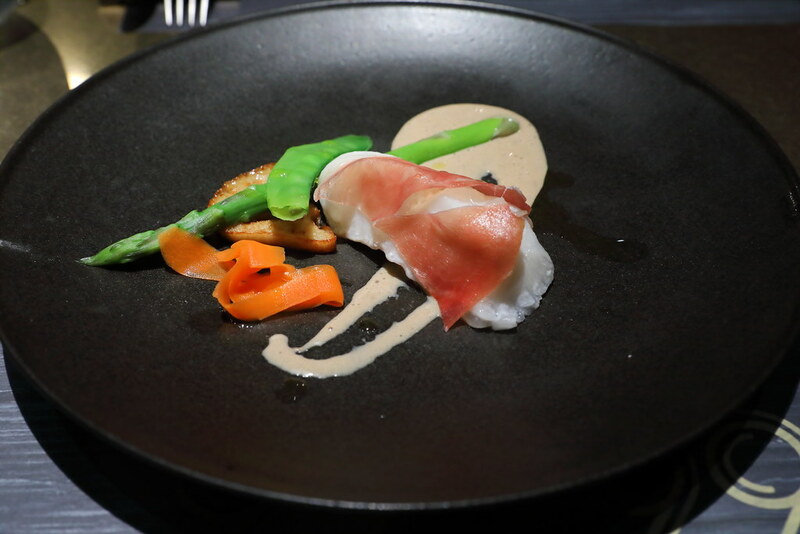 The next dish is Steamed Cod Fish Rolled with Parma Ham with Porcini Cream Sauce. The cod fish was cooked to a nice moist texture which paired excellent with the porcini cream sauce. 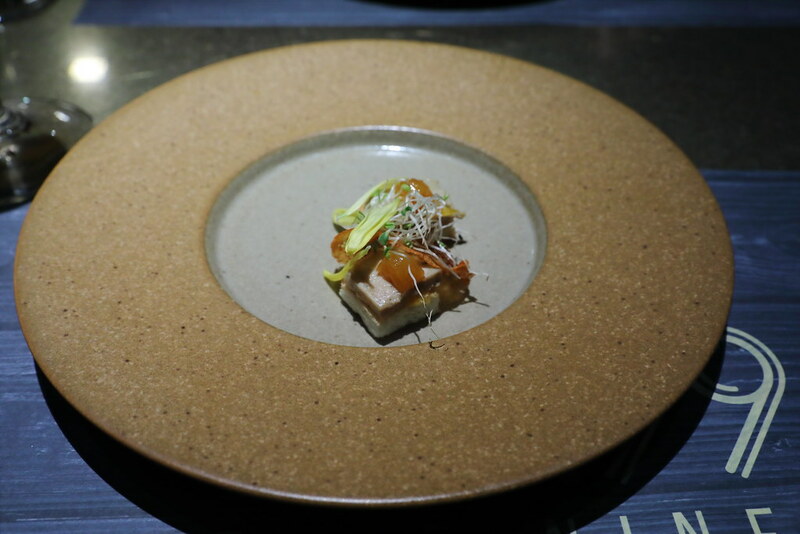 While it is a nice dish, I am not sure the technique used in cooking the cod fish is the best choice to bring justify to the fish. 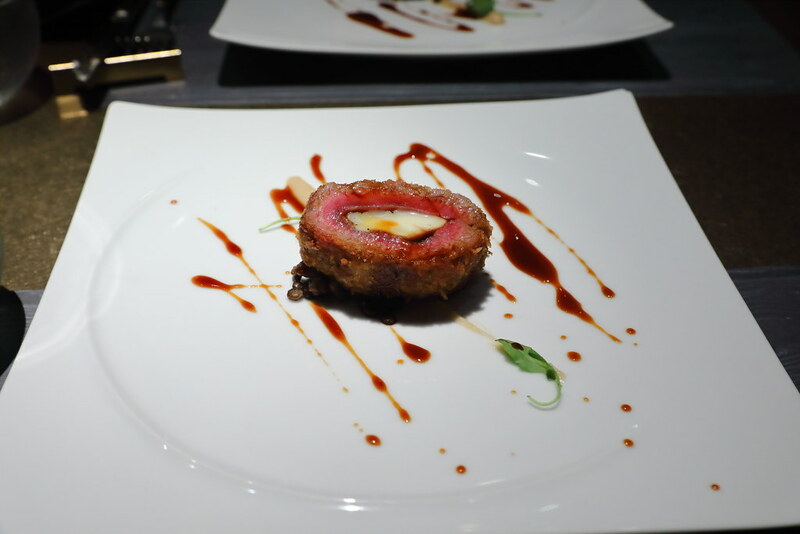 For those that is afraid of the gamy flavour of lamb, you will not find it in the Mozzarella and Lamb Tenderloin Fritto with celeriac puree, Japanese pepper fond de veau sauce. This is probably the best dish for me among the six-course dinner. The flavourful meat is cooked to tender. The stuffed mozzarella provided the additional boost in flavour to elevate the whole enjoyment. 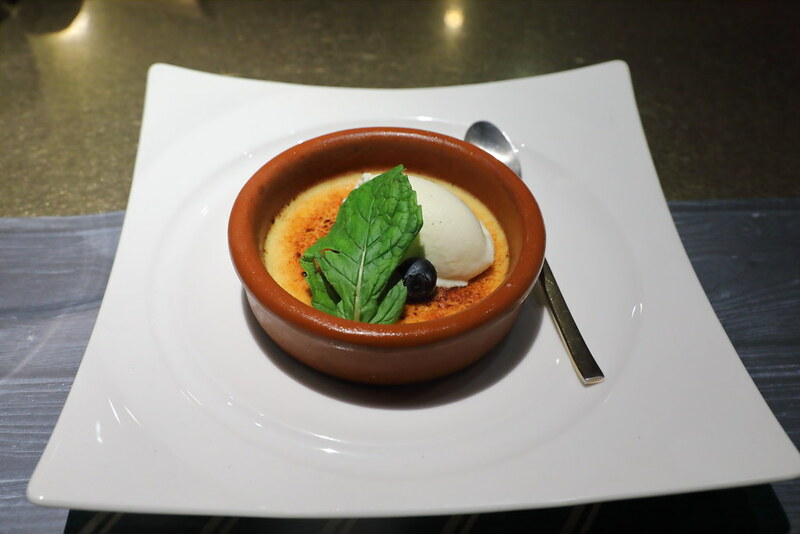 Lastly, the Creme Brulee wrapped up the six-course dinner. I thought the custard was a little wet but it seems the others in the group did not think so and quite enjoy it. Guess its up to individual's preference. 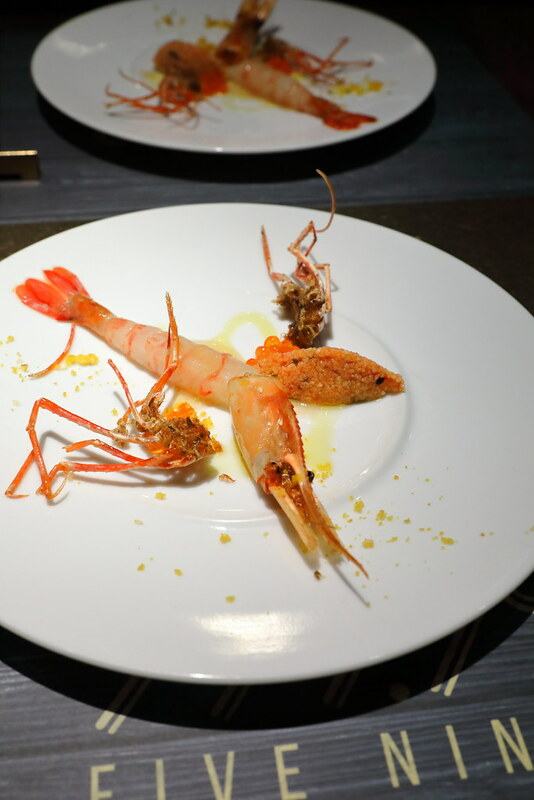 Overall, I felt that the six-course dinner at $49 is quite value for money. However it terms of the dishes, I felt Five Nines has lost its shine to be the gold standard. It really needs some polishing to get back its shine if it wants to bring back the crowd.